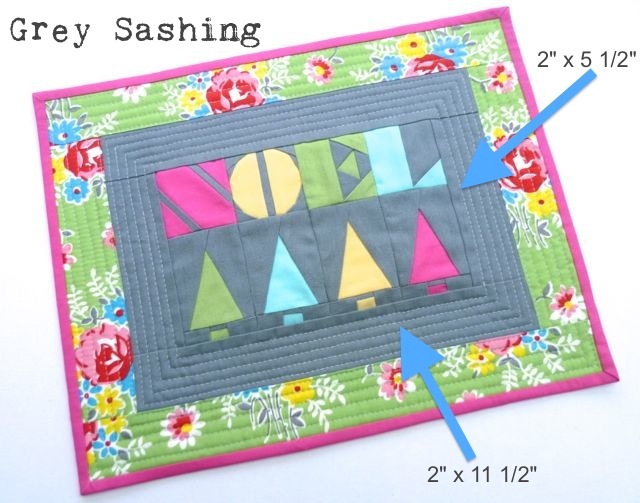 Here is a super quick tutorial for those of you who have bought 'Sew Very Christmas' pattern set and wanted to make the mini quilt with the 'Noel' and 'Candy Tree' patterns. 1. Make 1 set of Noel letters and 4 candy trees following the pattern instructions. Place a tree under each letter and join-the width of the letters and the trees are the same. Join each pair of letters/trees together to make the centre of the mini. 2. Add sashing. I added background solid sashing in grey starting at the sides- 2 strips each measuring 2" x 5 1/2", and then 2 strips across the top and bottom each measuring 2" x 11 1/2". 3. Add a further sashing border in a colour print. Add the side strips first, 2" x 8 1/2" and then the top and bottom strips each measuring 2' x 14 1/2". 4. Make a quilt sandwich with batting and background fabric cut and inch larger than your mini quitl top. Spray baste/ pin or sew baste layers together. Quilt as desired. 5. Add a single layer binding- see my tutorial here for binding and here for mitred corners. Your mini is complete! We would love to see your Sew-Ichigo project makes, you can add them to our Flickr group. 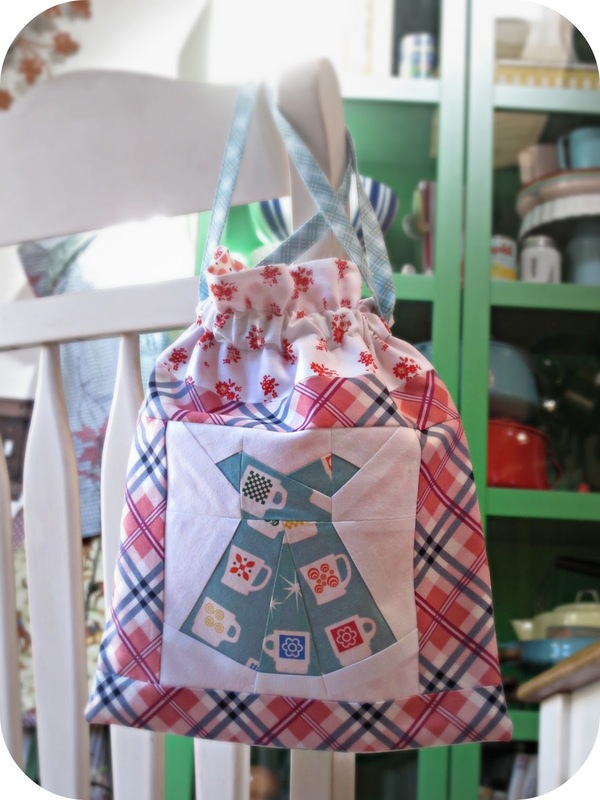 Jeni's lined drawstring pattern was ideal for our 'Sew Very Christmas' blocks. Jeni gives dimensions to make 8 different bag sizes. All we had to do was make the blocks the same size as the exterior main pieces and follow Jeni's instructions! The "tiny" gift bag was perfect for two candy trees side by side on the front and back. I used Anna Maria Horner's Little Folks voiles for the jewel like colours and motifs, they reminded me of decorated trees, and Essex linen in 'Bleached White'. 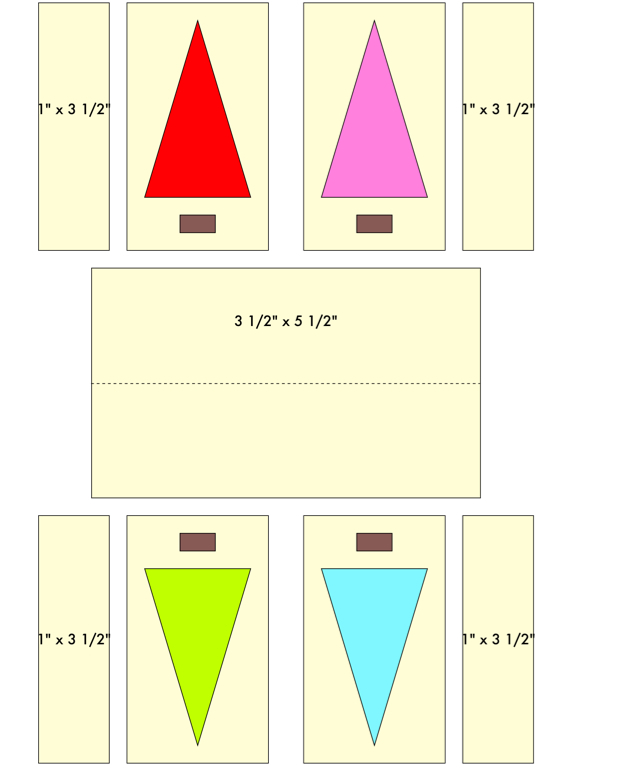 To make the exterior main pieces I made 4 candy tree blocks, finished size 2 "x 3" and added rectangles as below. Note the directions of the trees. I used a single panel to make the lower sections of the exterior main pieces and put a horizontal fold along the centre as there will be no seam at the bottom to align the side gussets. 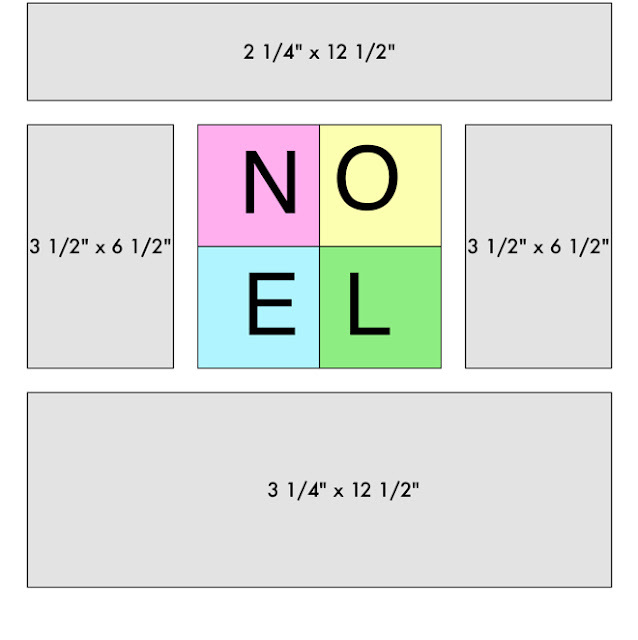 For the 'Noel' bag, I increased the 'Noel' blocks by 150% on the print option to make each letter measure 3" x 3"finished size and joined them together in a square arrangement. I used the "project bag" pattern and added sashing strips to the 'Noel' block to make the main exterior front (see diagram) and used a plain linen for the back-Robert Kaufman's Essex Linen in 'Steel' and assorted solids form my stash. The floral accent fabric is a Denyse Schmidt DS print. I made Jeni's "everything bag". The only thing I changed was I didn't add the gusset as suggested in the pattern. I used some spoonflower fabric for the dress and DS quilts for the background as well as some of Tasha's Simple Life for the accent fabric in the drawstring area. 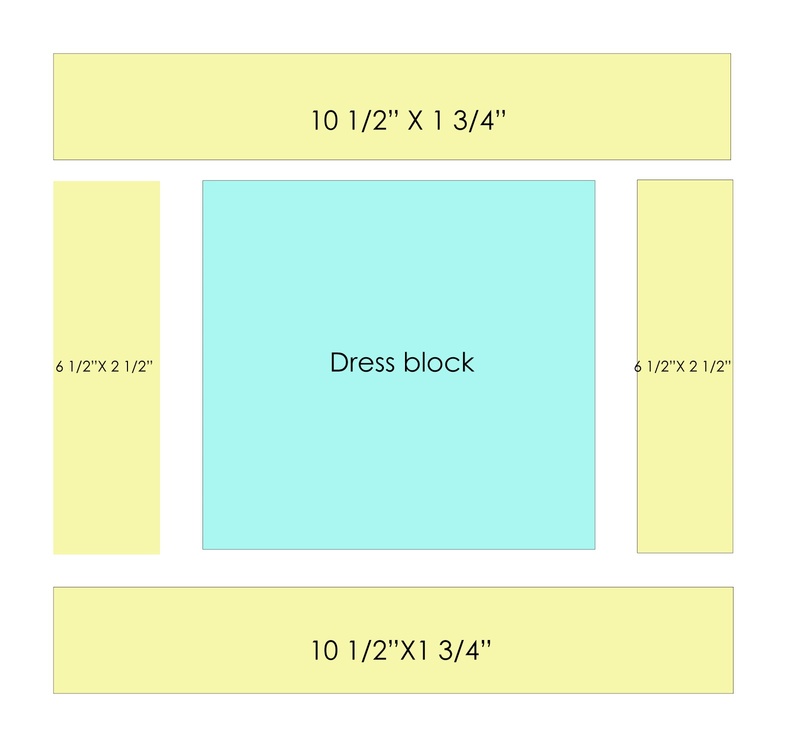 Here's a diagram for how I pieced the front exterior of the bag to get it to the correct dimensions. 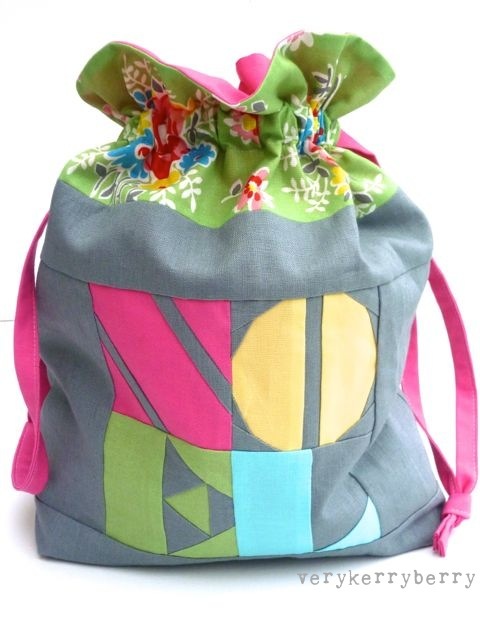 And then, my favorite of the bags I made, the 'Retro bulb' bag using the "CD bag" pattern. I used solids for the bulb and the background is all gingham from Tasha's line "simple life". The top fabric is shasta daisy by Suzuko Koseki. 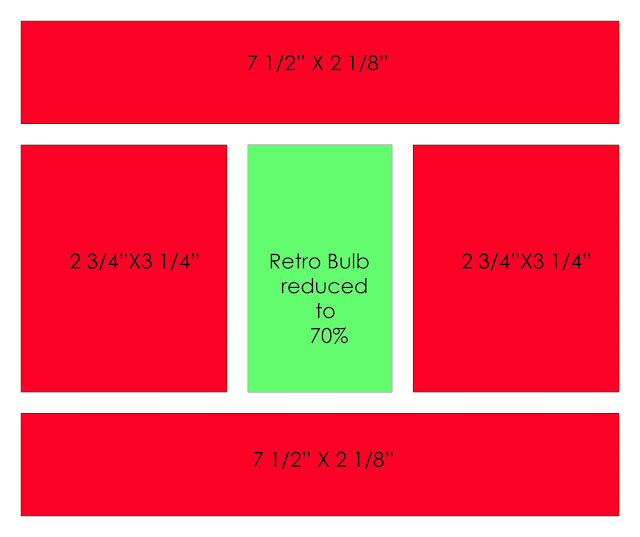 And here's diagram for piecing the front of the bag using the retro bulb pattern. 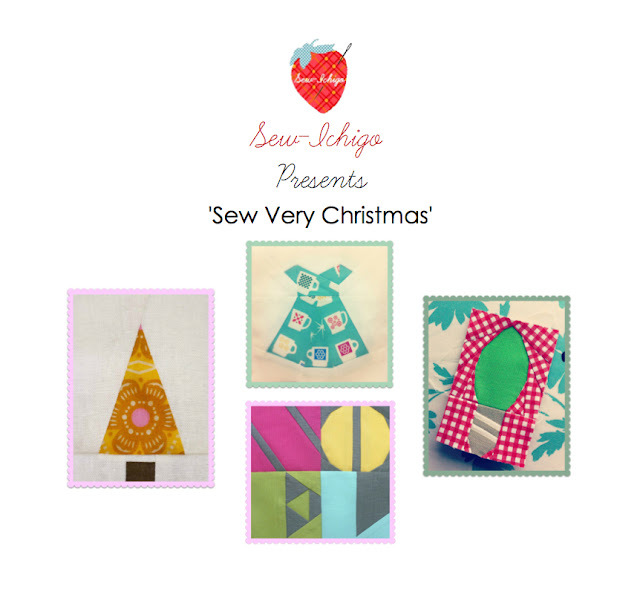 We hope you enjoy using our 'Sew Very Christmas pattern' for your gift making. 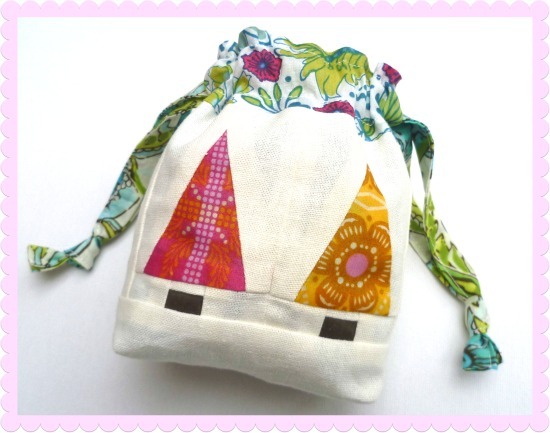 We would love to see your projects, you can add your pictures to the Sew-Ichigo Flickr group. We are happy to present our new pattern set, 'Sew Very Christmas', ready for the season of gift making and giving. We have aimed to keep these patterns as simple as possible with minimal sections to join and no curves or Y seams. 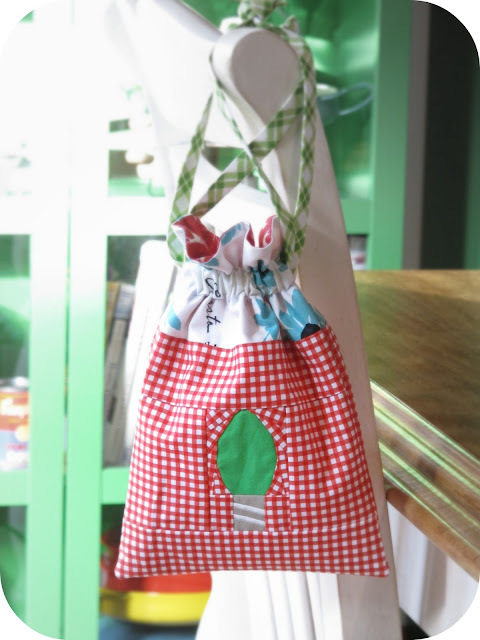 Ideal for tags, bags and pouches and more so you can wrap your presents with style. Our pattern format has been revamped for a cleaner, leaner format with a smaller file size and less to print and download! Penny and I have made a series of projects for you to see here. Many use Jeni's Lined Drawstring Bag Pattern which is excellent for creating bags of many sizes and we will be sharing our tips on adapting the blocks for the pattern. 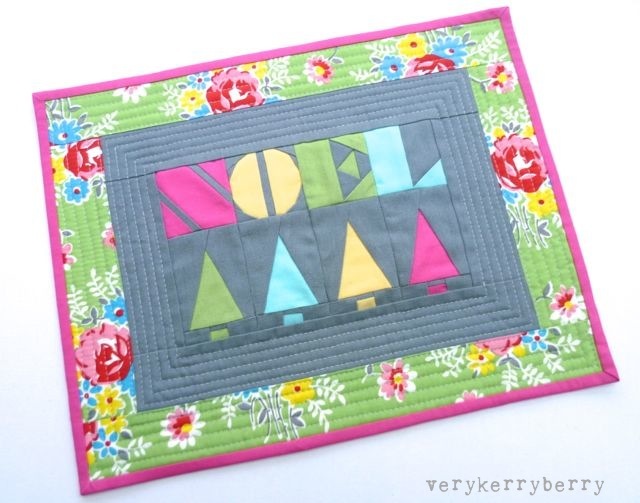 I also made a mat (tutorial to follow) to showcase the first two patterns 'Candy Tree' and 'Noel'. The blocks are the same width (2") and work beautifully together. I don't use solids often and I think I need to review that as they glow in this mat! 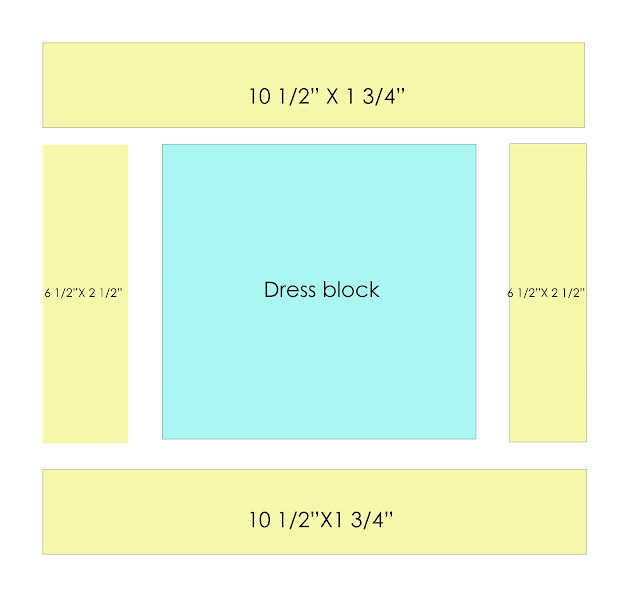 You can easily enlarge all the blocks in the pattern set and we include instructions for this. 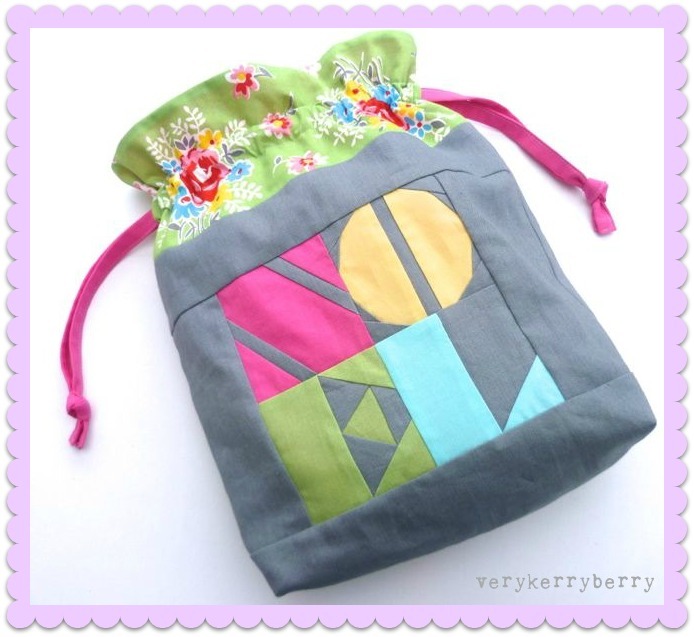 I enlarged the 'Noel' pattern by 150% to make 3" blocks in this project sized bag from Jeni's pattern. Penny designed the most adorable 'Christmas Dress' block and it looks perfect with the plaid in this drawstring bag. She captured our favourite 1950s vintage vibe in the 'Retro Bulb' block. She used the CD bag from Jeni's pattern with this block to make a gift bag. A tutorial on making the mat is coming later today and we will do a further post on using Jeni's bag pattern with the blocks. In the meantime, the shop is open! You can buy the pattern here or at our Craftsy store. Happy shopping and happy sewing! Penny and I have been busy behind the scenes, a bit of this and bit of that, you know how it is. We have a new Christmas/Holiday season pattern set about 10 days away from release and we have been tweaking and streamlining our format to bring you a more concise, easy to read pattern experience- less to download and print whilst still retaining all the vital 'how to' info. We have put our piecing guidelines into a free download rather than including them in every pattern we produce and they are now available to everyone - just click here or here, scroll to the bottom!